When someone passes away, their deceased estate may be insolvent or it may become insolvent during the course of being administered. But what happens in these circumstances? And, if you’re in charge of the administration of an insolvent deceased estate, what should you do? Below we cover the main procedures and regulations – and the actions you’ll need to take. A creditor owed at least $5,000 by the deceased by way of a Creditor’s Petition. The debtor was a member of a firm or partnership carrying on business in Australia. It is also a requirement for the filing of an Administrator’s Petition that the deceased estate be insolvent and, whilst not specifically referred to in the Act, the insolvency of the estate will be relevant to the success of a Creditor’s Petition. An application by way of an Administrator’s Petition is made under section 247 of the Act using the Federal Court Form 15 – Administrator’s Petition. The application must be accompanied by a Statement of Affairs (AFSA Form 4) and an affidavit from the person administering the estate. 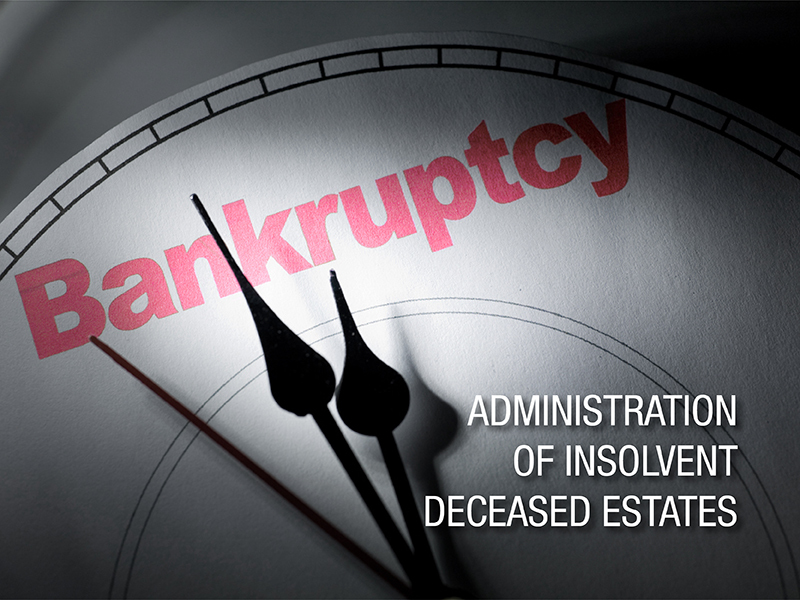 When an order is made for the administration of a deceased estate, divisible property of the deceased will vest in and be able to be sold by the bankruptcy trustee appointed. An interest held by the deceased in a regulated superannuation fund. When an order is made under Part XI of the Act, the majority of the Act will apply to the administration of the estate. Sections 149A to 149Q, which allow for a bankruptcy trustee to object to the automatic discharge of a bankrupt. All of the relevant sections of the Act that relate to a bankruptcy trustee’s remuneration, costs, accounts and audits, reviews of a bankruptcy trustee’s decisions, reporting to creditors and holding of meetings will apply in the administration of a deceased estate. If you are administering an insolvent deceased estate and you would like some advice, please don’t hesitate to get in contact with us for a no-obligation meeting.